Home Builders Association of Greater Knoxville resumes our member-based education series that will feature 3-person expert panels comprised of HBAGK members. The next workshop of 2019 is scheduled for 11:30 AM on May 1 at the HBAGK office and the topic is: Business Law. The series will continue on the first Wednesday of each month during lunchtime to accommodate most members' schedules. Future topics will cover Aging in Place, Energy Efficiency, Clients from Hell, Sustainability and Green Building, and Appraisals. 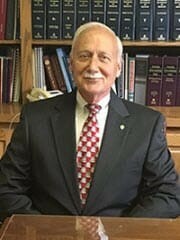 Mr. Vaughan graduated from the University of Tennessee with honors and from the University of Tennessee College of Law in 1972 with high honors. He previously taught business law at the University of Tennessee from 1971 through 1973 and later taught law courses at the University of Puget Sound in Tacoma, Washington. Mr. Vaughan is listed in Outstanding Young Men of America and in Who's Who in American Law. He is a member of the American, Tennessee and Knoxville Bar Associations and is admitted to practice before all Tennessee courts, the Federal District Courts and the United States Supreme Court. Terry Adams, The Adams Law Firm & Admiral Title, Inc.
Terry Adams is the founder and managing attorney of the Adams Law Firm, founder and president of Admiral Title, Inc., and Adjunct Professor of Law at The University of Tennessee College of Law. Terry focuses much of his practice on contract law, property law, and litigation. He has served on the faculty of the National Business Institute teaching contract law and ethics. In addition, Terry has taught Amateur Sports Issues as well as Sports & Entertainment as member of the Tennessee Bar Association faculty and is a former NFL Player Agent. His education includes a Doctorate of Jurisprudence from the University of Memphis, a BA from the University of Tennessee, and additional study at the San Francisco School of Law Advocacy Program, Harvard Law School Program on Negotiation, and the US Army War College. Terry served in the United States Navy and studied abroad in in Spain and Hungary. Terry has been peer reviewed as “Top Attorney” in several categories as published in Knoxville Cityview Magazine including Real Estate Development & Financing Law, Business Law, and Sports & Entertainment Law. He is admitted to practice law by the Supreme Court of the State of Tennessee, United States Tax Court, and the United States District Court, Eastern District of Tennessee. He is also a certified arbitrator for the Better Business Bureau, and a member of the American, Tennessee, and Knox County Bar Associations as well as the Tennessee Trial Lawyers Association. RSVP with names of ALL guests to help us plan, thanks! *Series sponsorships available - HBAGK members may pay a sponsorship fee to cover lunch based on the number of estimated participants or they may cater/prepare lunch in person pending pre-approval. Class attendance in 2018 ranged from 20 to 30 guests. Sponsors will be allowed to speak for 5 minutes and provide handouts, etc. Company logos can be included on invitation emails and event webpage if received in time. Lunch is served at 11:30, speakers begin at 12:00 PM, Q & A to follow. The goal is to wrap up by 1:00 PM so everyone can get back to work. Lunch is generously provided by Knoxville Title Agency!